It's been a long time since I did any updates to this site. I've been working on a new book so its taken a lot away from posting. To tell you the truth I've grown tired of posting here. It seems that everything I post you can find on another site. News and reviews of every one's point of view and well I'm not sure my point of view is important. Don't get me wrong I still love and enjoy Doctor Who, but for the time being - at least until I finish my current book and a couple more - I won't be posting here. I hope you are all enjoying the current series of Matt Smith I know I am, and I hope to be back one day to continue this site. Until then, you can follow me at my writing site www.charlesmillhouse.com where I may even sound about Doctor Who there. Bringing us up to speed, here is some Doctor Who news. David Tennant and Catherine Tate are to appear in a production of William Shakespeare's Much Ado About Nothing, which opens in London's Wyndham Theatre from 16th May 2011. They will be playing the roles of combative lovers Beatrice and Benedick in the play, being directed by Bush Theatre Artistic Director Josie Rourke. Sarah Smart is playing a character named Jennifer Lucas. Her recent on-screen credits include Wallander, Casualty 1906/1907/1909 and Five Days. Leon Vickers is a new actor, having just graduated from the Royal Scottish Academy of Music and Drama. His television credits include Garrow's Law and Being Victor he is believed to be playing a character named 'Clone Worker' in Doctor Who. Sorry I've been away. Haven't much time to play with this site. But I'm back and hope everyone had a good Holiday season. There is the very tenuous chance that Toby Whithouse may be writing for series six, if you want to read anything into this story. This story will be set and filmed partly in Utah. Guest starring: Daniel Mays (the villainous DCI Jim Keats from the final series of Ashes To Ashes) and Emma Cunniffe (The Lakes) who play the parents of Harry, played by child actor Jamie Oram (info from The Doctor Who News Page). Other info: “Game-changing cliffhanger,” says Moffat. 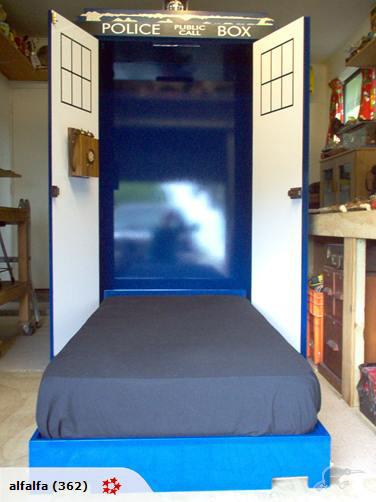 A New Zealand craftsman built this Doctor Who-inspired Murphy bed for his son, and now he's auctioning it off. If you want to dream in relative dimensions in space, then get to bidding. The police light works, LEDs pulse, the telephone talks—TALKS!—and shines a Southern Cross on the ceiling. Granted, you've gotta ship it from New Zealand, but for the geek parent who needs the perfect bed for his geek kid—or the nerd Casanova who wants to make the Earth move—there's really no other option. But hurry up: the auction ends on Dec. 9. The lost opening to Craig Ferguson's Doctor Who show that was pulled by the producers at the last moment.